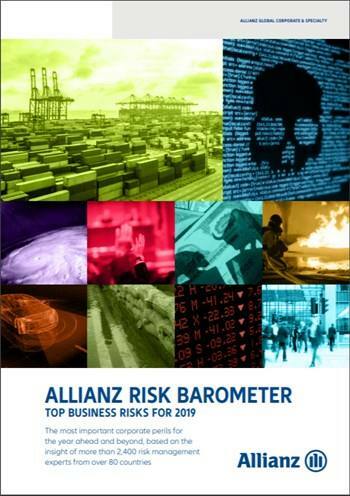 A consequence of many of the other top risks in the Allianz Risk Barometer, business interruption (BI) is the top threat for companies for the seventh year running (37% of responses). According to AGCS, the average BI property insurance claim now totals over €3mn ($3.4mn) at €3.1mn. This is more than a third (39%) higher than the corresponding average direct property damage loss (€2.2mn) with these totals significantly higher than five years ago. Losses from the largest events can be in the hundreds of millions or higher. Businesses face an increasing number of BI scenarios. Many can occur without physical damage but with high losses.